Centering is one of the fundamental principles of Pilates and refers to the connection between mind and body. When Joseph Pilates first developed his method, the focus of centering was on the the body’s core or “Powerhouse”. This is because Joseph believed a strong powerhouse provided a solid foundation for movement. Joseph never clearly defined what the Powerhouse was, but the consensus is that it is the exact center of the body. The exact center is between the upper and lower half of the body, and the right and left side. This is where you will find your deep abdominals and pelvic floor. These two things play a vital part in supporting our torso and back. A strong, stable “Powerhouse” is integral to good Pilates practise, as this is where all movement emanates from. If your powerhouse lacks strength you are more prone to injury. Pilates can help reduce this risk of injury. But, a strong Powerhouse is not the only important element of centering. The connection between our mind and body and the awareness this connection creates is just as important. Through your Pilates journey you will develop a stronger awareness of how you move and where that movement comes from. 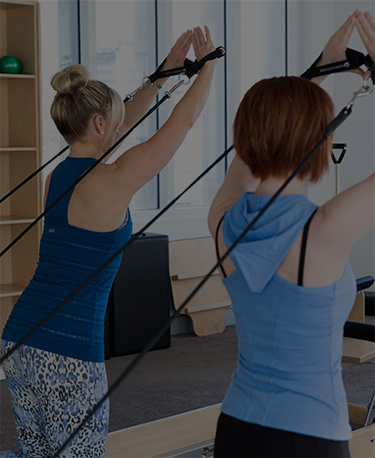 Your instructors will work to help you create that connection between mind and body. The techniques you learn in your sessions will soon feed into your everyday life, as you become more aware of your body and the way it moves.